I received a lovely parcel of brown crab meat and brown crab toes courtesy of Yawl Bay Seafood. They claim this crab meat is special because it retains its freshness even after two weeks in their packets. They’re not joking around. I got the parcel on Friday but it was only until today that I got round to cooking with it and it was still deliciously sweet and fresh. 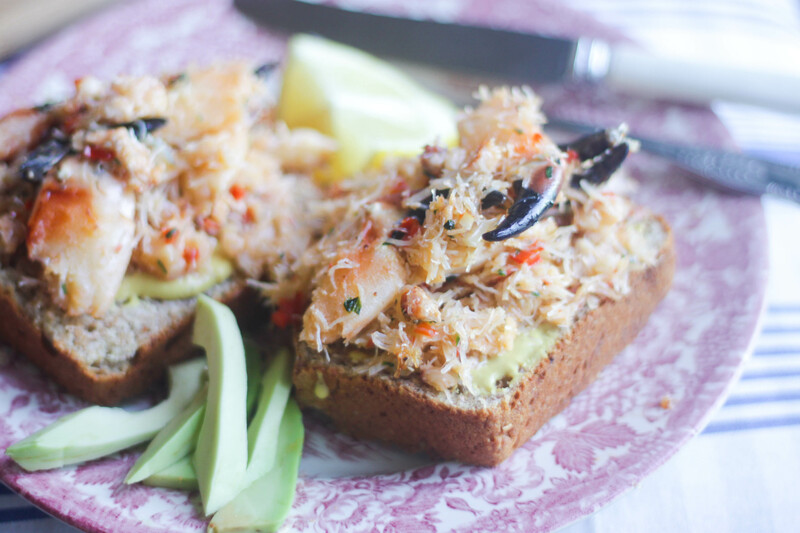 It’s essential that you get good quality and the freshest of the fresh crab meat for this recipe. If you’re in Dublin, head over to Kish Fish near Smithfield. Or if you can get your hands on some Yawl Bay Seafood crab meat, that’d be ideal. It’s lovely stuff. Start by heating a large frying pan over a medium to high heat. Add the tablespoon of butter to the pan. As the butter is melting, finely chop your garlic cloves. De-seed and finely chop the chilli. When the butter has melted and is starting to bubble, add the garlic and chilli to the pan. Cook for one to two minutes. Now you can add the crab meat (and toes if you have them!) to the pan. Break up the crab meat with a wooden spoon. If you think the mix needs a bit more butter, add another teaspoon or so. Mix everything well so the garlic and chilli coat the crab meat. Add a squeeze of lemon juice, and a good pinch of salt and pepper. Cook for three minutes. Finely chop the fresh basil leaves and add to the crab mix. You want about a tablespoon of chopped basil. Cook for another one or two minutes, until the crab meat is warmed through. Meanwhile, toast four slices of bread. Spread a little bit of Dijon mustard on each side. Go easy as you don’t want to overpower the lovely crab. Divide the toast between two plates. 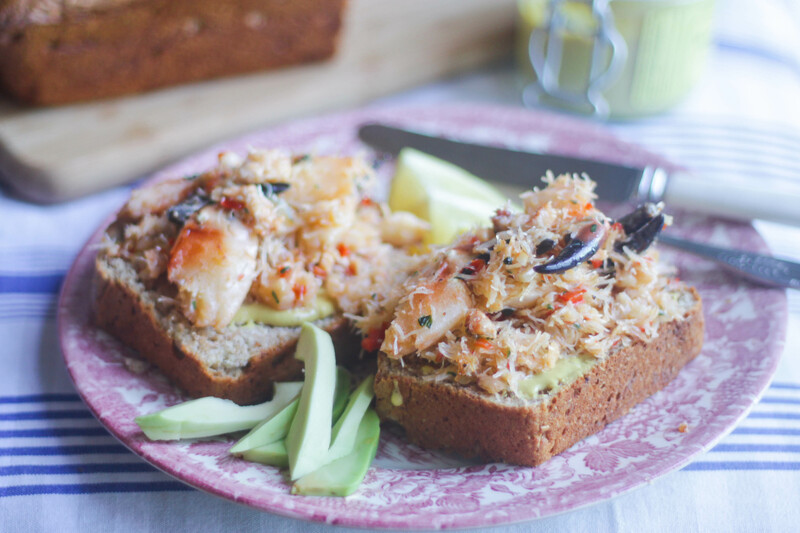 Now you can top each slice of bread with a spoonful of crab meat, being careful to divide the crab toes (if using!) equally among the two plates. You don’t want to start a row over who got more crab toes. 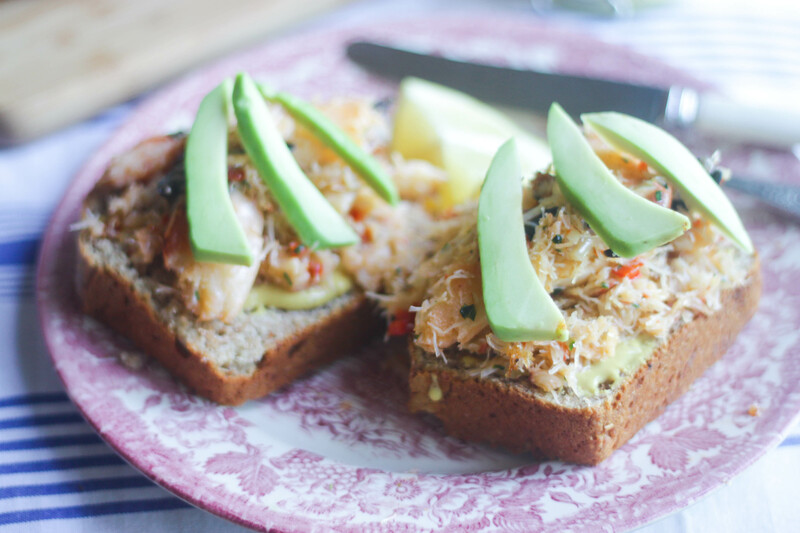 Slice your avocado and place them on top of the crab, or on the side of the plate. You might want to leave them on the side so that the full beauty of the crab is on display. Serve with a slice of lemon on the side. Lush! P.S. Does anyone else feel uncomfortable saying “crab toes”? Are they the same as crab claws or are crab claws much bigger? My buddy Alan who writes the brilliant Bitzl R music blog recommended Newcastle upon Tyne artist Beth Jean Houghton to me this morning. It turned out to be a perfect antidote for Tuesday Drama. Have a listen to her track Dodecahedron below. Yum!! I love the sound of this snack, Aoife. I’ll have to keep an eye out for that crab meat, I’m never sure which one to buy. It is a lovely little meal – and it’s actually more substantial than a snack surprisingly! I was full after it. And I have a massive appetite! I think brown crab meat is a good thing to go for, and it’s coming in to its peak season in the coming months, I think. It seems January is the best time for buying fresh crab meat. Hope you find some lovely fresh crab meat asap! I know! Why does eating crab claws sound better than crab toes? Crab is amazingly filling, love it. Yay crab!